A blog by a Dutch-American software engineer working for Google. Two improvements in the engine: removed unnecessary restriction on search depth and fixed bug that could cause an out-of-bounds exception. The engine now detects draw by a simplified form of three fold repetition. The detection is not complete, since only limited game history is kept; but at least this new feature avoids some very annoying repetitions. 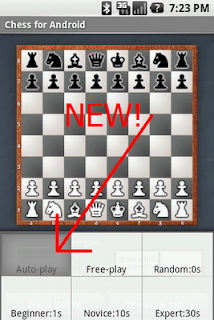 Draw by the fifty move was already implemented. A new level "Auto-play" has been added (press the Menu button). If this level is selected, then the next time the engine takes control (make either a move or touch "Reverse sides"), the game is played automatically. Aart was born in Gouda in the Netherlands. He moved to the United States in 1996, where he now works as software engineer at Google in Mountain View.